It’s Healthy Eating Week! Our second article this week looks at how we can make small swaps to everyday dishes, making us feel and look healthier! Parkside’s talented Dietitian, Michelle Bremang, shares her tips for healthy food swaps. We lose body fat by creating a negative calorie balance through eating less or burning more, or a bit of both. To lose a pound of fat, you need to be aiming for a calorie loss of 500 calories per day over the course of a 7 day week. This is because 1 pound of fat contains a total of 3,500 calories. If you have 10 pounds of fat to lose (35,000 calories), and you’re burning 500 calories a day, it should therefore take you a minimum of 70 days to lose those 10 pounds. Tip: You will have more success at keeping the weight off in the long term when you lose it slowly – at a rate of 1- 2 pounds a week, because this way you’re more likely to be losing fat weight and not muscle and water. Try mustard instead of mayonnaise on your sandwiches, where calories can sneak in all too quickly. Just one tablespoon of mayonnaise can add 90 calories whereas mustard on the other hand is often 0 calories. Sometimes that second piece of bread isn’t always necessary. By trying open faced sandwiches, you cut almost 110 calories. Furthermore, if you eat it with a knife and fork, you’ll eat more slowly – allowing you to have a better idea of when you’ve had enough food and avoid overeating. Eggs and cheese do go hand in hand in an omelette, but alternatives such as chives, spring onions, red pepper flakes, or vegetables such as mushrooms, can all add flavor without the extra calories. You’ll save more than 100 calories and 20 grams of sugar by swapping to ‘diet’ or ‘zero’ versions of your fizzy drinks. For a healthier alternative, try adding slices of lemon, lime or orange to still or sparkling water or adding no added sugar cordial or mint leaves. 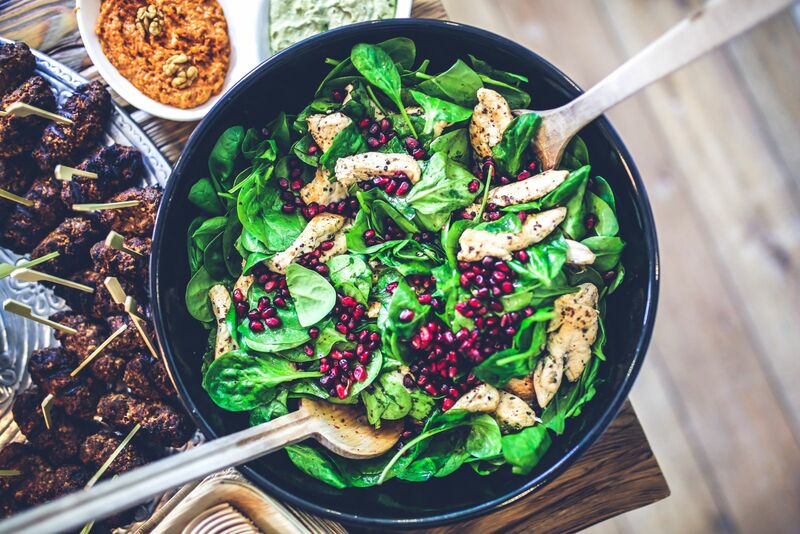 Salads can become a diet nightmare with the addition of oil-drenched vegetables such as roasted red peppers, sugar rich dried fruit and the addition of creamy dressings which can add more than 200 extra calories to your salad which was supposed to be a healthy meal choice. By adding fresh fruit and vegetables, you save calories and increase the fibre content – all of which makes your salad more filling, satisfying and nutritious. Using balsamic vinegar as a dressing instead of thousand island or french dressings, can reduce the calories substantially. If that’s too tart, try adding a little olive oil to tone it down –but remember that one tablespoon of olive oil is 120 calories, so use it sparingly. By swapping calorie-rich sour cream for a fat free alternative such as Fage or Skyr yoghurt, you can save over 30 calories, for a similar taste. Although your large morning latte can provide a healthy dose of calcium, it can also provide a hefty dose of calories. Add a flavour shot and you increase to nearly 400 calories per large cup. Try reducing your portion size and asking for skimmed milk to really cut the fat and calorie content, whilst still getting a healthy dose (450mg) of calcium. Soya milk contains 50 calories more per large serving, but is still a healthier alternative than whole milk. Popcorn can be a healthy and high fiber snack which can be kept low calorie, but only if you prepare it correctly. Avoid the pre-packed popcorn bags or homemade versions with added sugar and butter – and invest in an air popper. By air popping kernels, not only are you guaranteed to have each kernel popped but you’ll consume fewer calories. Try adding artificial sweetener, red pepper flakes, cinnamon, cocoa powder, or even a dash of classic salt and pepper for some flavour ideas without the calories. Using “just a little” bit of oil in the pan can add over 100 calories. Avoid these calories by using cooking spray instead, or by measuring out portions of fat – one teaspoon of oil per person. By spraying the oil, it will be well spread out, meaning that much less is required. Investing in a good non-stick pan will also significantly reduce your need for adding oil during cooking. Greek yogurt parfaits can be a great breakfast, but they can also be a sugar and calorie-filled trap. Instead of using sugary granola, try adding cinnamon and mixed berries to a plain high fibre cereal to enhance flavour and help keep you fuller for longer. With the festive cheese platters now out of the way, cheese lovers may be pained to know that a matchbox size piece of cheddar cheese contains just over 100 calories. Goat cheese can be a creamy, tangy, lower calorie alternative compared to high fat versions such as cheddar or stilton when you’re watching your weight. For a change to your usual week night dinners, try using your spiraliser to make squash spaghetti and courgette or even sweet potato noodles. These examples of veggie alternatives will both cut calories and count towards your 5-a-day. If you serve them with your favorite sauce and toppings, before you know it you’ll think you’re eating your pasta, al dente! Avoiding the burger bun can save nearly 130 calories, and you’ll find that you’re still just as full, thanks to the appetite reducing effect of the protein packed burger patty. When it comes to sauces, stick to red. White sauces tend to be loaded with cream, butter, and overall calorie-rich ingredients. Red sauces, on the other hand, are often filled with vegetables and will contain fewer calories and sugar. Find out more about Dietetic Services offered at Parkside Hospital and how to book an appointment here.